[141 Pages Report] The global herbicides market is estimated at USD 27.21 billion in 2016 and is projected to reach USD 39.15 billion by 2022, at a CAGR of 6.25% during the forecast period. Secondary research was conducted to obtain the value of herbicides market for regions such as North America, Europe, Asia Pacific, South America, and RoW. The key players have been identified through secondary sources such as the Bloomberg, Businessweek, Factiva, agricultural magazines and the annual reports of the companies, while their market share in the respective regions has been determined through both, primary and secondary research. 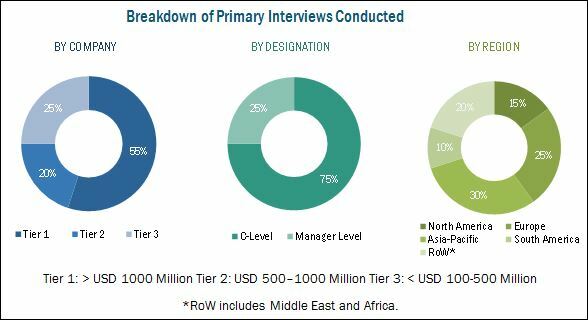 The research methodology includes the study of annual and financial reports of top market players as well as interviews with industry experts (such as CEOs, VPs, directors, and marketing executives) for key insights (both quantitative and qualitative) for the herbicides market. The contributors involved in the value chain of the herbicides market include raw material suppliers, R&D institutes, herbicides manufacturing companies, such as BASF (Germany), DowDuPont (US), Monsanto (US), and Syngenta (Switzerland) as well as government bodies & regulatory associations, such as USDA, FAO, PAN, and Eurostat. This research report categorizes the herbicides market based on type, crop type, mode of action, and region. The global herbicides market is estimated at USD 27.21 billion in 2016 and is projected to reach USD 39.15 billion by 2022, at a CAGR of 6.25% during the forecast period. The primary factors that drive the herbicides market are the adoption of better farming practices and rise in production of cereals & grains particularly in the Asia Pacific region. Herbicides are one of the major crop protection chemicals used for weed control. The herbicides market is segmented on the basis of herbicides type, mode of action, crop type, and region. On the basis of type, the herbicides market was dominated by the glyphosate segment and was followed by diquat and 2,4-D segments in 2015. With increasing use of glyphosate-based products in various forms, such as gel and powder across countries, glyphosate is projected to remain a leading segment. Diquat herbicide accounted for the second largest market share in 2015. Diquat is considered as a substitute for paraquat as both are non-selective contact herbicides and have almost similar chemical properties. Hence, the usage of diquat has increased, particularly in China and other developing economies, after declaring paraquat a restricted use pesticide (RUP) by environmental protection agencies in more than 30 countries. The herbicides market, based on mode of action, is segmented into non-selective and selective. The non-selective herbicide segment has the largest market share in 2015. As non-selective herbicide is formulated for both, broadleaf and grass weeds, it finds application in most of the vegetation types and is a preferred alternative to selective herbicides. Additionally, with the introduction of GM crops that have herbicide tolerance, the demand for non-selective herbicides is projected to increase during the forecast period. South America held the largest market share for herbicides market in 2015 and is projected to increase further in the next 5 years. Additionally, less stringent regulations in South America as compared to those imposed in other regions has led major players to expand in this region. Asia Pacific is projected to grow at the highest CAGR of 6.96% during the forecast period, due to advancements in crop protection techniques against weeds and increasing demand for low-priced generic herbicides formulations. 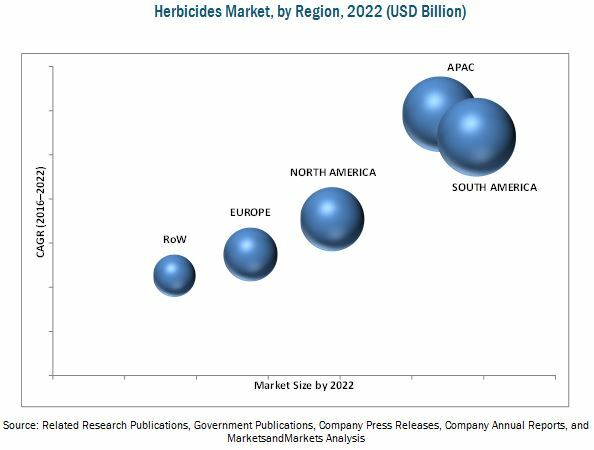 The herbicides market is highly concentrated at the global level with several multinational companies accounting for a significant share of the herbicides market. The herbicides market in developed countries has become saturated, and the demand is projected to increase in the developing countries. The key players identified have a strong presence in the global herbicides market. The major market players include BASF (Germany), DowDuPont (US), Monsanto (US), and Syngenta (Switzerland), FMC Corporation (US), Arysta (US), Nufarm Ltd. (Australia), Nissan Chemical Industries (Japan), and Drexel Chemical (US).